Thomas Albert “Tom” Schmitz, 82, of Nauvoo, Illinois, passed away at 11:56 a.m. Tuesday, July 10, 2018 at the Great River Hospice House in West Burlington. Born March 23, 1936, on the family farm in Sonora Township rural Nauvoo, Illinois the son of Donald and Leonora (White) Schmitz. He was a farmer then enlisted in the United States Navy serving from 1956-1958. Following his honorable discharge he returned home and on May 18, 1958, at the Christ Lutheran Church in Nauvoo he married B. Joanne Repplinger. She preceded him in death in 1981. Survivors include his daughter: Sandra K. (Chris) Stone of Londondairy, New Hampshire and his son: Michael R. Schmitz of Nauvoo; four grandchildren and four great grandchildren; one brother: Philip (Fran) Schmitz of Montrose, Iowa; two sisters: Sharalee (Danny) Baxter of Altamont, Illinois and Barbara Monroe of Springfield, Illinois. Tom is also survived by his special friend: Betty Smith and her family of Nauvoo and several nieces and nephew. He was preceded in death by his parents; wife: Joanne and brother: Donald Schmitz, Jr.
Tom was a member of Christ Lutheran Church in Nauvoo. He helped build the Nauvoo Elevator in the early 1960’s. He went on to work for Colusa Elevator Company of Nauvoo in 1962 retiring in 1999. 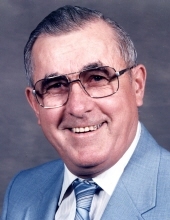 He served on the Nauvoo City Council from 1973 to 1979. He also served on the Nauvoo Fire Department for 33 years. He loved to golf and fish. Tom touched many lives while living in Nauvoo. He will be greatly missed by all who knew him. Friends may call after 1:00 p.m. Friday, July 13, 2018 at the Christ Lutheran Church in Nauvoo where the family will meet with friends from 4:30 p.m. to 7:00 p.m.
Funeral services will be held at 10:00 a.m. Saturday, July 14, 2018 at the Christ Lutheran Church in Nauvoo with Pastor Pete Hagglund officiating. Burial with a flag presentation by the Nauvoo American Legion Post 711 will be in the Nauvoo City Cemetery. In lieu of flowers the family requests memorials be made to Nauvoo Fire and Rescue. To plant a tree in memory of Thomas Albert Schmitz, please visit our Tribute Store. "Email Address" would like to share the life celebration of Thomas Albert Schmitz. Click on the "link" to go to share a favorite memory or leave a condolence message for the family.